Most facilities have some type of chemicals or other things that are dangerous, yet necessary for getting specific jobs done. Most of the time these products are used without any problem, but in the event of a spill it is important to be able to get them contained and cleaned up as quickly and safely as possible. This is why it is so important to have a good spill kit available that can properly clean up the specific solution that is spilled. It is so important in fact that there are OSHA spill kit requirements that must be in place when working with certain types of chemicals and other products that could be spilled. Understanding these requirements will not only ensure you are in compliance with the rules and regulations but it will also help keep your employees and your facility as safe as possible. The first thing you need to keep in mind is that when it comes to OSHA spill kit requirements there is no ‘one size fits all’ rules. Spill kits that are used around oil, for example, will be different than those that would be used to clean up blood or other biological materials. Learning about the different requirements that will apply to your specific facility is very important. In some cases you may need more than one kit to ensure you can properly clean up any spill that occurs. Take a moment to learn about the different types of spill kits available and when they should be used. Safety Gloves – Having nitrile safety gloves will provide protection to the person cleaning up a spill. These types of gloves are resistant to corrosion from chemicals. Eye Goggles – If even a small amount of many chemicals, oils or other things get in the eyes it can cause severe problems. This is why it is so important to keep your eyes protected with these goggles. Shoe Covers – It is often necessary to step in the spill while cleaning it up and these shoe covers will protect your shoes and your feet. Sorbents – The absorbent items that will actually clean up the spill need to be able to quickly absorb and hold in a variety of liquids. OSHA spill kits can have any number of types of sorbents. Most will have larger pads to put over the spill, pillows to contain and absorb the spill and smaller sorbent socks. Handbook – Having the information you need to stay safe during a spill is also important. Most good spill kits will contain a book that helps you determine the potential dangers associated with cleaning up a specific type of spill. Disposal Bag – Having a large bag or other storage bin that can hold everything after it has been used until it can be properly disposed of is absolutely essential. If you work in an area where large, powerful batteries are present it is important to have an OSHA approved battery acid spill kit. These are different than other options because they can clean up the very corrosive battery acid safely. Many things such as the nitrile gloves, eye goggles and storage bags. In addition to these standard items, the battery acid kids also have a poly apron to help protect your clothes from getting holes in them if the acid comes in contact with them. Having a special polymer that will neutralize the acid is also very important as it can minimize any damage during and after the cleanup process. While not always required, most spill kits of this type will have a scoop to help pick all the acid up. Mercury can be very dangerous but it is a necessary element in things like fluorescent light bulbs, many types of thermometers and some lab equipment. Mercury spill kits need to contain amalgamation powder, indicator powder to make sure it is all cleaned up, a vapor suppressor bottle, an aspirator bottle and a chemical sponge to absorb all the mercury. This is, of course, in addition to all the standard items included in all OSHA spill kits. Bio-Hazard Sorbents – These are special sorbents that are made to absorb and secure biological materials. They can come in many shapes and sizes including large mats, thick pillows and more. Neoprene Gloves – Neoprene gloves will help ensure nothing gets onto your hands. Many kits will have gloves with longer sleeves to help keep all the biological materials off your wrist and arms too. Sanitizing Surface Wipes – Once you’ve cleaned up all the visible biological materials you’ll want to sanitize all surfaces with these wipes. They are made to kill any bacteria or virus that is left behind. Sanitizing Hand Wipes – While you should ideally shower as quickly as possible after cleaning up a biological spill, these wipes will sanitize your hands and arms until that is possible. You can typically buy kits that will have everything that is needed based on the OSHA spill kit requirements. Even when that is the case, however, you may want to add in your own things to help improve the overall safety. For example, you can add a breathing respirator into any of these kits to help ensure nothing is inhaled while cleaning up the mess. Another common thing that facilities will add into their spill kits is a laminated instruction sheet that has the facility spill response procedures written on it. This will help ensure everyone knows how to respond in the event of a spill. Another important tip to keep in mind is that you should always provide good training to anyone in the facility so they know how to use the cleanup kits. While the maintenance or safety team should ideally be the people to clean up any hazardous spill, it may be necessary for other people to do it in certain situations. Having the general usage instructions for cleanup kits explained to everyone who works in the facility will help ensure everyone is as safe as possible. In addition to making sure everyone knows how to use the safety kit in the event of a spill it will also help employees determine whether they should clean it themselves or get the proper maintenance department to take care of it. Spill kits should be kept as close to the area where the things they are made to clean up are kept. For example, if you are operating a medical facility, the blood born spill kits should be kept in the blood lab. Letting everyone know where each kit is stored will allow them to grab it as quickly as possible. It may even be a good idea to use labels or floor signs near where the kits are kept to make them easier to find. If it is at all possible, your facility should have at least two of each of the needed spill kits on hand at all times. This is because spill kits are made to be used just once and then disposed of. After a kit is used you will need to order a new one to replace it. If you don’t keep a spare on site you will be left without one until the replacement arrives. Of course, if your facility uses a lot of things that could be spilled it may be best to have more than just two. 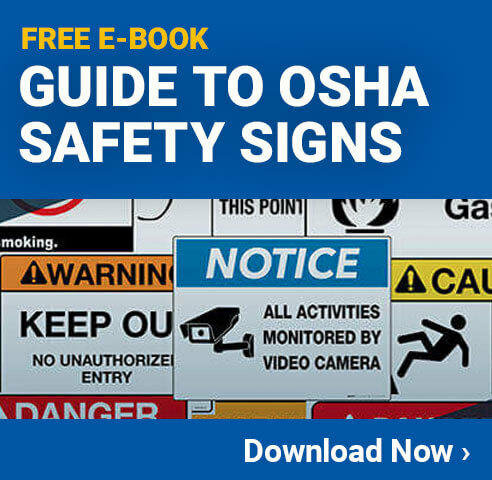 There is no requirement from OSHA regarding exactly how many you would need to have so each facility will have to evaluate their own needs based on their budgets and risk levels. The bottom line whenever thinking about spill kits is that they should always be used to eliminate hazards and improve the overall safety of a facility. Keeping them properly stocked and ready to use at all times will not only keep your facility in compliance with OSHA but also improve the safety of the entire facility. 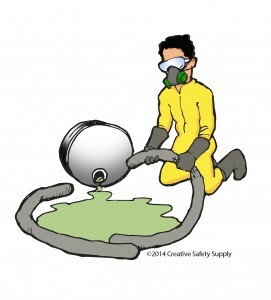 Make sure to contact Creative Safety Supply for all your spill kit and product needs related to hazardous cleanup.